When people think about ‘community safety’ they tend to immediately think of the police. Some will also think of the rôle the council plays. Relatively few, sadly, think of the work the Fire Service play. During my three years as executive member I’ve never ceased to be impressed at the energy and dedication the local fire service have brought to the partnership and it was great that the committee had the opportunity to hear and talk about it last night. This was the second report on the overall picture of crime by geographical area – a few months ago the committee had considered the Tooting area and makes for interesting reading. The distribution of crime is quite telling, but not that unsurprising, in its link to relative deprivation. Battersea also suffers as it appears to ‘import’ crime from Lambeth. As I did with Tooting, I would recommend having a look through the report which gives a fairly full picture of the pattern of crime in Battersea. As before, Ordnance Survey copyright means I can’t reproduce the maps from it here. I’ve mentioned the decision to withdraw the regeneration scheme twice before on the blog. Last night saw the report that formally informed members. It generated a discussion for all the wrong reasons, with Labour saying that we shouldn’t have listened to Gordon Brown’s optimistic prognosis for the recession. Good to know that they are now disowning their leader in public meetings! The fact is that I had always been bullish about the recession, and during internal discussions was invariably the most pessimistic participant. Despite that, I also knew that the recession was a temporary thing and would, eventually, end. But I never expected it to last 18 months (the longest on record). Nor did I imagine we would be the last industrial economy out of recession. And I certainly did not realise it would be so deep. 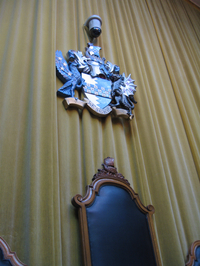 It was right that the council were ambitious for Roehampton, rather than giving up on it at the first sign of trouble (the Labour party’s line last night was that they supported regeneration, but we should have given up earlier), and a tragedy that circumstances outside the council’s control have put an end to it. Finally, the committee decided to undertake a review of the way Safer Neighbourhood Teams (SNTs) work in the borough, and particularly how they communicate with other agencies. My personal experience of SNTs, both in Shaftesbury and across Wandsworth, has been positive. There are some dedicated officers doing some great work in their wards. However, this is often marred by poor communication between the panels and the council. And that’s not really a complaint, they are police officers rather than administrators or communication professionals. But it means that, for example, an SNT panel in the west of the borough might not be learning from an SNT panel in the east or the south. I think there’s potentially some very exciting work to be done in this area that will improve the way the council and the panels work with the SNTs and it will be interesting to see the outcomes.